Imagine eating some quesadillas or some sincronizadas or some ranch style eggs – plain – without any condiment, without any seasoning, with nothing. That would be a ver dry and very sad dish... that’s why we have “the salsas" that are essential to fill the Mexican food of flavor and color. The red salsa is a 100% authentic Mexican salsa, its flavor is condimented, spicy and fresh . Although the best about this salsa is its intense red color because it makes the dishes look appealing and very Mexican. This salsa has endless applications , it can be used to put to antojitos , tacos , tortilla chips , tostadas , etc. It is also used to bath main courses like the enchiladas and even to cook dishes like the pozole. To make this salsa first some ingredients are roasted and then all the ingredients are blended – that easy. This recipe is given with 5 arbol peppers to obtain a moderately spicy salsa. Although the chilies quantity can be adjusted, depending on how spicy you want it. This salsa is also prepared with other chilies, depending of the Mexican region where it is made. We give the recipe that is most commonly used in Mexico. If you would like to prepare the red salsa in molcajete, just don’t use the blender. Recipe for 2 cups of salsa. Blend very well these ingredients. 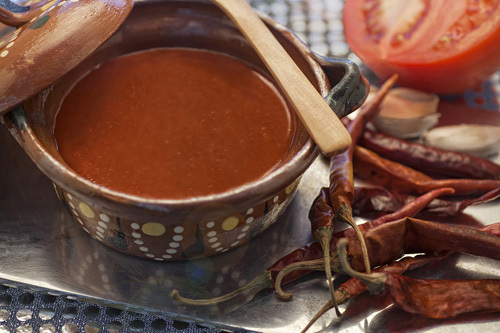 Variation: Also prepare the red salsa with morita pepper , a salsa that is widely used in taquerias . These are the arbol peppers that you have to use for your salsa because they are of very good quality, they are very spicy and its intense red color is divine. For this recipe you will need a griddle that distributes well the heat like the Lodge. It is also easy to clean and its size is ideal to place many ingredients. Put the red salsa in this small clay cazuela, it will look beautiful and very Mexican.